We are looking for presenters to participate in our upcoming Technology Convergence Conference (TCC) held on February 2, 2012 at the Santa Clara Convention Center in Santa Clara, CA Hosted by TELADATA, the Technology Convergence Conference provides a cost-effective, local, full-day educational conference for IT Professionals, Facilities Professionals, CIO’s and CTO’s, Building Operators, Engineers and anyone involved with the design, planning and project management of a building’s technology infrastructure. Elevate your career and be recognized as a thought leader in your field by sharing your experiences, ideas, and best practices. 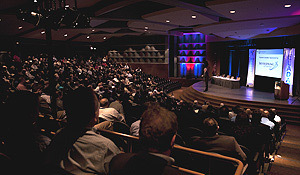 Expose your level of expertise to Facilities and IT Professionals and Executives from influential companies nationwide. Significant presence and name recognition on the TCC website, and on conference banner displays.